Please note that the quality of this recording is due to the covert nature in how it was recorded, and has been edited now to eliminate the introductions in Swedish and to optimize volume. 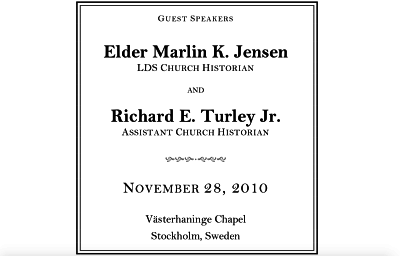 On November 28, 2010, an emergency fireside was held in Stockholm, Sweden by Elder Marlin K. Jensen (Church historian at the time) and Elder Richard Turley (assistant Church historian) to address the faith crisis that ensued among an entire group of members and leaders in Stockholm including a stake president and Hans Mattsson, an Area Authority. This episode features the actual recording from that meeting.